The best so-called “horse movies” are especially successful when they manage to seduce those members of the audience who have never identified as horse lovers. Alex Dawson and cinematographer Greg Gricus have created such a film, with their feature documentary Wild Horse, Wild Ride. The film is a gripping portrait of several individuals who train fully wild mustangs (described as “never been touched” horses), a near-impossible feat to accomplish in three months. Often playing more like a cowboy/cowgirl movie than a documentary, Wild Horse, Wild Ride takes the viewer on an unforgettable journey across the American Southwest where, together, man and beast reign supreme. The subjects of the film are first introduced as participants in the annual Extreme Mustang Makeover Challenge. 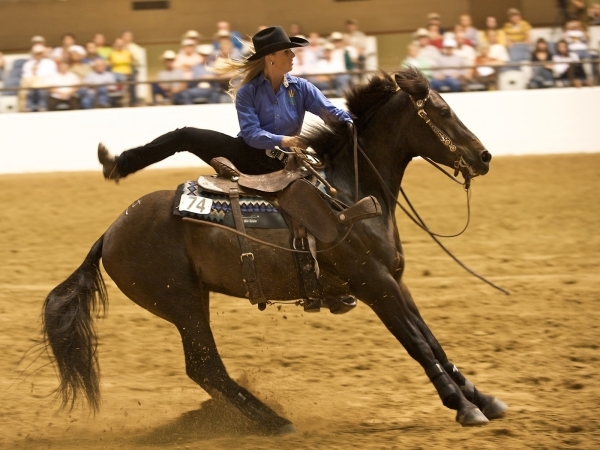 The challenge is unique—and exciting—because professional horse trainers as well as amateurs can participate; folks from all over show up in Texas to pick up their randomly selected horses, creatures who have never been “touched” (petted) and which they have ninety days to train before a competition that ends with an auction where all of the horses are adopted. As the unique stories of the participants unfold, the dramatic tension of the film builds at a slow, but deliberate pace. One young woman (Melissa, the amateur) eventually admits to having a Ph.D. in biomedical engineering, and desperately wants to be “more” than just a professor, which is why she joins the challenge. The grumpy (but yes, lovable) cowboy George and his wife Evelyn are initially portrayed as that old married-since-adolescence couple. But as they struggle through the early (and most difficult) days of horse training, George confesses that he’s on his seventh marriage. He and Evelyn are newlywed seniors, married for three years and training mustangs. This slow-reveal approach captures the essence of all eight subjects of Wild Horse, Wild Ride. In addition to George and Melissa, the film follows a Navajo father/son duo; Jesus, a gifted horse-whisperer from Mexico; and two brothers from New Hampshire. And then there’s Wylene, the fearless, false-eyelash-wearing cowgirl and self-described “daredevil with a big smile.” As the film progresses, documenting the grueling but thrilling experience of training and riding wild horses, these subjects become larger-than-life characters, superheroes in their own right. Like any good film, Wild Horse, Wild Ride is a love story. All of the trainers know they must eventually give up the horses they raise, which is why the elder Navajo, Charles, advises, “Never fall in love with a horse.” Naturally, he fails to take his own advice (but he’s in good company with the rest of the trainers). What Charles does highlight is one of the over-arching themes of the film—training a horse is much like being in a relationship. Nearly everything depends on the difficult task of building and maintaining trust with another being, in spite of the great risk. Wild Horse, Wild Ride is an amazing documentary that captures this risk ,and the unavoidable pressure and pain (sometimes physical) that accompanies life’s biggest and most rewarding moments.